Maybe they weren’t really ever gone but even so Commodore enthusiast [ALWYZ] is here at HOPE X spreading re-awareness of the Commodore 64 and that there is still a community of Commodore fans out there who have been up to some pretty cool projects. One of those projects is a Quantum Link-esque service called Q-Link Reloaded. Quantum Link was an online service available for Commodore 64 and 128 users that offered electronic mail, online chat, file sharing, online news, and instant messaging. It lasted from the mid-80s to the mid-90′s and later evolved into America Online. In 2005, a group of folks reversed-engineered the original server code and the resultant Q-Link Reloaded lets the Commodore folks once again communicate with each other. Also on display is a Raspberry Pi running a C64 emulator complete with a controller to GPIO adapter. Hackaday has covered this emulator just a few months ago and it is great to see it working in person. History is written by the victors, but for all those generations of console wars we've managed to weather through, what about the other guys? 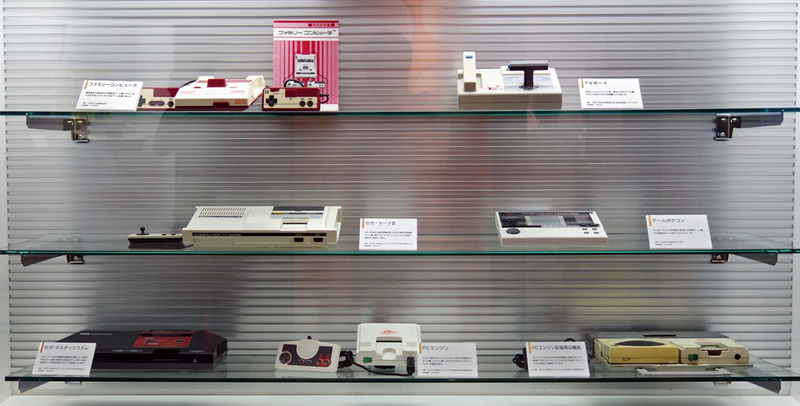 Opening this week, a newgames museum in southern Japan houses 56 different consoles of varying fame (or infamy). For every NES/Famicom, there are curiosities like the huge "Pocket Home PC," failing on the very definition of its name. Remember the Sega Game 1000? We didn't, but we should probably cut these (mostly) beige consoles some slack. While most of the devices toured here weren't a commercial success, each helped gently push gaming toward its current state -- if only by firmly demonstrating what we didn't want. And yeah, we wish the Dreamcast was still around too. Here's to the games consoles we've loved and lost over the last 40 years. For a while it appeared as though Japan’s booming video game business was immune to the country’s drawn-out economic bust. As Japan slumped into a deep recession, the industry flew an inverse trajectory, reaching a dizzying peak in 1997 thanks to the invigorating success of Sony’s PlayStation. But soon enough the long winding lines of consumers that greeted each new high-profile game release in Akihabara also began to shrink as the nation’s previously insatiable appetite for electronic entertainment waned. In 2002, America overtook Japan as the world’s biggest consumer of video games and in 2003 Europe nudged into second place.Of all the video game console manufacturers, Nintendo had the most to fear from this decline. Just as game sales were in dramatic regression in the company’s key home territory, so Sony’s PlayStation 2 had cast a long shadow over the GameCube, with Microsoft’s newcomer selling 2 million more units of its Xbox than the one-time Japanese leader of the home console market. Moreover, for both Sony and Microsoft, video games were just one component of a sprawling empire. If their respective game divisions performed poorly for a time, other areas of the business could take up the slack. For Nintendo, as with Sega before it, there was no fallback. If the company couldn’t turn its speeding decline around, it would have little choice but to follow Sega in turning its back on the console hardware business to focus exclusively on publishing.It was into this tumultuous landscape that Nintendo’s new president, Satoru Iwata stepped in 2002, replacing Hiroshi Yamauchi at the helm of a company headed for disaster. In November 2003, for the first time in the company’s history, Nintendo announced a loss for the beginning half of the fiscal year. In the same breath, Iwata-san proclaimed that the company was developing a new system, neither a successor to the GameCube nor the Game Boy Advance, but a system that would “go back to basics” in the hope of attracting gamers of all ages, and players with no prior experience of games. This feature is an extract from Simon Parkin’s book, An Illustrated History of 151 Videogames. With the growing success of adult-focused games and online connectivity, the direction made little sense. While the desire to widen the boundaries of the games industry to encompass a broader mass market appeared logical, Iwata’s statement that “you can’t open up a new market of customers if you can’t surprise them” seemed cavalier in Nintendo’s immediate context. A year later, when the Nintendo DS was unveiled, method still seemed to have been overtaken by madness. The silvery, somewhat bulky handheld system – decidedly not, as Nintendo was only too keen to emphasize, a successor to the GBA – opened like a book to reveal two screens, one of which was a touch screen that could be interacted with using a stylus. Despite the in-built microphone and wireless connectivity there seemed no way that this Game & Watch style throwback could be anything other than a side-project for the company. Sony dismissed the system as a gimmick, ‘a knee-jerk reaction’ to its futuristic, widescreen PSP handheld system, while many developers seemed equally sceptical and confused as to how to employ the system’s idiosyncratic capabilities.Within 12 months, Nintendo had not only proven its detractors wrong, but had turned around the company’s fortunes. In the space of just one year the Nintendo DS sold 13 million units while the handheld accounted for 45 per cent of all software sold in Japan in 2005, enabling Nintendo to leapfrog Sony’s control of the software market. As with the Game Boy, Nintendo began to iterate on the hardware, releasing the DS Lite and then the DSi in various incarnations, and by 2010 over 135 million units had been sold globally.Most significantly, the Nintendo DS had proven Iwata’s assertion that chasing innovation rather than technological superiority was the key to Nintendo’s future, a simple ideological shift that would have a profound effect. Never underestimate the force of revenge. Without it, Sony’s PlayStation would never have made it from designer Ken Kutaragi’s wild imagination into 102 million homes around the world. Neither would games have popped into 3D with the forceful brilliance facilitated by Sony’s debut without that most ancient of creative incentives: a business vendetta.At the Consumer Electronics Show in June 1991 Sony unveiled its first video game console, a joint creation from the Japanese electronics giant and Nintendo. A Super Famicom with an in-built CD-ROM drive, the system was designed to be Nintendo’s route into the emerging world of multimedia entertainment, as well as Sony’s first tentative step into a market that, to date, it had watched from afar.The next day, Nintendo announced it would be breaking its deal with Sony, instead partnering with its rival, Philips, on the project. Few snubs in Japanese business have been played out so publically, and the turnabout was humiliating to Sony, despite the fact that the relations had been deteriorating for months over how revenue would be shared and collected by the two companies.The next month Sony president Norio Ohga called a meeting to plan litigation against Nintendo. But financial recompense through the courts would not be enough to sate his appetite for revenge. Ohga stood to his feet and declared to the room: ‘We will never withdraw from this business. Keep going.’ This feature is an extract from Simon Parkin’s book, An Illustrated History of 151 Videogames. Kutaragi, buoyed by this support from the most senior level of the company, pulled together a team of engineers that had been working on a 3D graphics engine designed to augment live television broadcasts with 3D images in real time. The technology, dubbed System-G, shared technological similarities with the way video games work, even if, as a high-end workstation, the thought of introducing this sort of technology to the home seemed impossible.By June 1992 all relations with Nintendo had been severed and Kutaragi was called to present his work to Ohga and other Sony executives. It was here the designer revealed his plans for a proprietary CD-ROM based system capable of rendering 3D graphics for use in a video game. Ohga asked what sort of chip the machine would require and Kutaragi replied it would need one million gate arrays. Ohga laughed at the figure: the maximum Sony made at the time was 100,000. Kutaragi, in a moment of shrewd understanding, replied: “Are you going to sit back and accept what Nintendo did to us?”Ohga, wanting to protect Kutaragi from Sony’s board, who viewed video games as toys and feared entering the market would dilute the company brand name, moved the designer to Sony Music, a separate subsidiary. The move was significant as Sony Music understood that creative talent needs nurturing in a way that the drier, tech-focused core part of the company didn’t. Likewise, their expertise in manufacturing huge amounts of discs would prove invaluable.Attracting developers to the new system proved straightforward. Without an internal development studio at Sony, the lack of competition to many potential developers was an advantage. In Japan, Nintendo’s huge royalty rates made development for the machine a huge risk for publishers, so Sony’s more reasonable rates proved attractive. If you want more insight into PlayStation’s creation, Making Of feature from 2009 is an essential read. When PlayStation launched in Japan on 3 December, 1994 a huge number of developers across the world were busy creating software for the machine. Namco’s launch title, Ridge Racer, was a startling port of the arcade game, one that demonstrated the power of the system in no uncertain terms. All 100,000 launch units sold out, with another 200,000 units shifted in the following 30 days. Pricing was key to its success, and, even though Sony lost money on each unit sold until 1995, the fact the PlayStation was ¥5,000 cheaper than Sega’s Saturn helped Sony gain crucial ground in the 32-bit race.By March 2007, Sony had sold 102 million systems across the world, success born in a perfect storm of technology, pricing, marketing and, perhaps most importantly, old-fashioned rivalry and honour. Much of the PlayStation 2’s ubiquitous success could be attributed, not to its games or graphics, but to the fact that the machine doubled as an inexpensive and stylish DVD player. In 2004 convergence was the new slogan in video game hardware manufacturing and marketing. Games? Games were no longer enough, so the story went. As such, Ken Kutaragi’s focus when developing the PlayStation Portable was primarily on what the system could do when it wasn’t playing video games.It was this focus that drove the decision to use an optical media disc as the system’s storage media, Sony devising the Universal Media Disc as a kind of mini-DVD on which both games and movies could be stored and viewed. To emphasize the cinematic ideology behind the system, the company placed a lavish 4.3 inch widescreen display at the centre of the handheld, one that, with 16,770,000 colours, appeared to have skipped several steps ahead on the evolutionary scale to any handheld games technology on the market.When Sony revealed the handheld’s design at E3 2004 and attendees had the chance to see the machine while running, the curious hardware innovations of Nintendo’s rival DS seemed irrelevant. The PSP was a cinema in your palm. This feature is an extract from Simon Parkin’s book, An Illustrated History of 151 Videogames. The feverish excitement surrounding the machine’s Japanese launch on December 12, 2004 seemed at odds with Japan’s plunge into recession. Chinese importers employed the services of Akihabara’s homeless to buy up units to sell back home for astonishing profit. 171,963 units were sold on launch day with nearly 500,000 units shifted by the New Year.But the PSP’s initial signs of success did not bear out in the long run. At the time few would have bet against Sony’s decision to pack the most advanced technology into their first handheld in favour of Nintendo’s decision to eschew power in favour of what were ostensibly seen as gimmicks. But in commercial terms Nintendo’s courting of non-traditional game audiences paid off as the DS comfortably overtook the PSP in sales.The final boot in the PSP’s prospects (in commercial terms, at least) came on June 15, 2005 when hackers disassembled the PSP’s firmware and released a hacked version for download on the internet. When installed the new software allowed PSP owners to run homebrew software and pirated games from the memory stick – with a clutch of emulators available for playing out-of-print games as well as titles currently on the market. The homebrew scene’s gain was Sony’s loss, as rampant piracy eroded game sales and disheartened developers abandoned the system en masse. Almost a year ago, [miker00lz] started a thread on the Arduino forums telling everyone about a 6502 emulator and BASIC interpreter he wrote for an Arduino Uno. The chip inside the Uno isn’t a powerhouse by any means, and with only 2KB of RAM it’s far less capable than just about any computer from the 70s. Arduino works on a lot of different chips, though, and after a few months, [Jan] turned an Arduino Due into a Commodore 64 emulator. [Jan]‘s code isn’t limited to the DUE, and can be used with any chip with enough memory. If you’re feeling fancy, you can connect a TFT display for all the vintage goodness of PETSCII graphics, all while running a faster BASIC than the very stripped down EHBASIC. Because the emulator is using software to talk to the outside world, it should be possible to use this project to interface with the cooler chips found in Commodore machines – SIDs for one, but also the cartridge port for some vintage Ethernet goodness. It’s not even limited to Commodore machines, either: the POKEY chips found in Atari 8-bit micros are seriously underutilized in the chiptune and demoscene, and having modern hardware to play with these chips couldn’t hurt in the slightest. Do you ever miss your gaming system of yesteryear? [yv3] did so he built a retro gaming console. Even though [yv3] likes his old school games, he didn’t want to be stuck listening to old school 8-track tapes while playing those games. The solution for him was to build a retro gaming console with integrated internet radio. The gaming portion of the build relies on RetroPie. The RetroPie disk image contains all of the software and emulators needed to turn a Raspberry Pi into a dedicated retro gaming system. The RetroPie project supports a lot of gaming systems, [yv3] chose to include Atari, Sega Master System and Genesis, NES, SNES, and Turbografx-16. Raspberry Pi Internet Radio manages the radio portion of this project and is set up to start playing automatically when the unit is powered on. There are 5 buttons to change the station, volume and settings. The radio stations are managed by a text file residing on the SD card. Audio from the radio can be directed to either the HDMI or the analog out of the RaspPi. IPS Peek, the IPS (International Patching System) patch viewer, has been updated to version 0.4.0. This is the most significant update IPS Peek has received since it was originally introduced. File linking (with patched file difference highlighting): open a patch as normal, then click the “Link File” icon in the “Data View” toolbar to link a file. This will enable a special mode, where the patched data is applied to the linked file and highlighted (color-coded) data changes are shown. In this mode, yellow highlights indicate new data applied by a patch record. Red highlights signify when the patch record expands the ROM before writing (if you see red, then something may be wrong with the compatibility of the patch and the file.) Gray highlights represent data that is cut off by the Lunar IPS truncate extension (CHS). Clicking a patch record in the list will jump to and select the corresponding patched data. IPS Peek can now be used as a basic hex viewer for any file. See the full changelog included with IPS Peek (CHANGES.txt) for a more detailed list of changes. Look out for more great stuff coming in the future! Today we are releasing a complete translation patch for the wacky Japanese RPG, Ninja Rahoi. The translation was started by aishsha sometime in 2009 and he did most of the translation and hacking. Pennywise did all the final hacks and final draft of the script. We also had the help of several excellent translators who helped with us puns, obscure text and whatever else craziness the game threw at us. Those people are Ryusui, Eien ni Hen and harmony7. Without them, this translation would not be what it is now. This is also more than a translation. It is also a localization. The game featured a plethora of jokes and puns based on Japanese history and pop culture of the time. Just doing a literal translation would have stripped the game of its humor. So the decision was made to replace all the jokes with Western equivalents while retaining the spirit of the original. This translation is a lot of fun to play just for the text, but also a lot of work went into it. The game does take place in Japan and no attempt has been made to remove that aspect. It is and will always be a wacky Japanese game. Speaking of the game, it was made by the same folks who did Momotarou Densetsu, which was translated by KingMike a few years ago. Without having the played the game, there are probably similarities between the two. So if you liked that game, you’ll probably like this one. The game might be a DQ clone, but it is anything but generic. There are plenty of hilarious joke enemies and there is a Ninjutsu system that levels up through use in battle. The game does feature your old school grinding though. Lastly, the game does not use the traditional SRAM for battery backed saving. Instead it uses an external add-on for the Famicom called the Turbo File. It was made by ASCII, the same company who published this game. So if you’re playing on a flashcart, you won’t be able to save unless you have Famicom and a Turbo File. We did not feel like hacking traditional SRAM into the game, but if someone would like to do that for us, we would graciously accept it. Otherwise, use your favorite emulator. Hang around Hackaday long enough and you’ll hear about MAME, and all the other ways to emulate vintage arcade machines on a computer. The builds are usually fantastic, with real arcade buttons, MDF cabinets, and side graphics with just the right retro flair to make any connoisseur of ancient video games happy. MAME is only emulating old video games, though, and not physical systems like the digital pinball system [ronnied] put up on the Projects site. [ronnied] was inspired by a real life, full-size White Water pinball machine at his previous job, and decided it was high time for him to acquire – somehow – a pinball machine of his own. He had a spare computer sitting around, an old 16:9 monitor for the main playfield, and was donated a smaller 4:3 monitor for the backglass. With an MDF cabinet, PinMAME, and a little bit of work, [ronnied] had his own machine capable of recreating hundreds of classic machines. The build didn’t stop at just a few arcade buttons and a screen; [ronnied] added a 3-axis accelerometer for a tilt mechanism, solenoids and a plunger torn from a real pinball machine for a more realistic interface, and a Williams knocker for a very loud bit of haptic feedback. We’ve seen solenoids, buzzers, and knockers in pinball emulators before, and the vibrations and buzzing that comes with these electromechanical add ons make all the difference; without them, it’s pretty much the same as playing a pinball emulator on a computer. With them, it’s pretty easy to convince yourself you’re playing a real machine. With the Famicom achieving huge profits in the home video game market, Sega was just one of a number of companies eager to try its hand at launching an alternative, and wrestling some of Nintendo’s 90 per cent market share back. The company established an internal division, which was known as Sega Away Team, headed by Hideki Sato, tasked with developing Sega’s home consoles. Sato’s first hardware release was the Sega-1000, released in 1983 to disastrous response. However, lessons learned were used to design the Mark III, the system that would later be renamed the Sega Master System. The hardware featured a Zilog Z-80 processing chip and boasted 128 kilobits (a kilobit is one eighth of the size of a kilobyte) of memory, nearly twice that of the Famicom. Despite being more powerful than its rival, Sega lacked the software to make any impact on Nintendo’s market share in its homeland, and so began looking to the West in the hope of success, where the Famicom, redubbed Nintendo Entertainment System, had only just been released.Sega rebranded the Mark III as the Sega Master System, redesigning its futuristic white plastic casing for a black and red rectangular design, more in keeping with Western fashions of the time.While Nintendo had been steadily pulling away from its arcade business in favour of the home market, Sega emphasized its strong arcade presence. To attract consumers, the company bundled a home version of Yu Suzuki’s Hang On, its most popular arcade game of the time, with the Master System. However, without the handlebars used to control the arcade version, the home version seemed a little plain by comparison.With a tiny marketing department run by just two men, Bruce Lowry and Bob Harris, out of a small room in the back of the company’s coin-op games offices, Sega lacked the advertising clout that was necessary to rival Nintendo’s spread across America. Without a recognizable mascot to set against Mario, the Master System floundered in America and Europe, in the same way that it had in Japan, leaving Sato and his team to return to the console drawing board once more. By 1986 Japan’s home console market was burgeoning thanks to Nintendo’s Famicom and its evergreen success. PC manufacturing giant NEC Home Electronics, well aware of the continual drop in chip manufacturing costs, commissioned one of its R&D teams to design a console that could incorporate PC technologies into a video game system.Tomio Gotoh, one of NEC’s top semiconductor engineers, was placed in charge of the project. Gotoh, having been responsible for some of the very first DOS machines, was a highly experienced electronic engineer, but he had no understanding of the console market.As a result, Gotoh approached Hudson, a prolific third-party software developer that had been considering the hardware market, having seen at first hand the profits Nintendo was able to skim from third-party developers. The pair struck a deal to develop the hardware in partnership, and the PC Engine was finally conceived.Unlike the companies’ rivals, NEC and Hudson spent a huge amount of time and money developing the casing for the system, hoping to design a console that looked more like a stylish Walkman than a toy. The casing’s dimensions were finally settled on at a slender 135 x 130 x 35 mm, the smallest home console yet released. But it was the system’s internal power that really impressed. A 7.16MHz processor was paired with 64Kb of VRAM and four coprocessors to allow 64 sprites to be displayed on screen at a time. With potential for 256 on-screen colours pulled from a palette of 512, the system’s raw specs dwarfed those of the Famicom and Mark III. In Japan, at least, the machine’s excellent ports of Sega’s arcade titles, OutRun, Afterburner 2 and Thunder Blade, scuppered the Mega Drive’s chances in the region even before it was released.In 1988 the PC Engine was the best-selling piece of hardware in Japan, and the machine continued to be the second best-selling machine until the release of the Super Famciom. In the US the PC Engine, renamed TurboGrafx-16, fared worse, undermined by smart rival advertising by Sega that dubbed NEC’s machine an 8-bit machine and by the poor quality of its pack-in game, Keith Courage in Alpha Zones. Sega is nothing. Nintendo President Hiroshi Yamauchi would regret those words – an off-hand remark given to a Japanese journalist – when, four years after its debut, the Sega Mega Drive recorded sales of 7.5 million systems in the US, outselling Nintendo’s Super Nintendo by a factor of 2:1. For Sega’s staff, Yamauchi’s pronouncement acted as a thrown gauntlet. The company’s American CEO, Tom Kalinske, went so far as to pin a copy of the phrase on every door in the Sega offices, a challenge to his staff to prove the venerable businessman wrong.But in 1988, Yamauchi’s bullish diagnosis made reasonable sense. Nintendo’s Famicom swaggered into its fifth year with a rudely dominant 90 per cent of the video game hardware market share and one machine in every three US homes. Sega’s Master System machine, meanwhile, limped behind, having secured fewer than a quarter of a million sales in Europe, showing an equally poor record in America and Japan. Despite its technical superiority over the Famicom, the lack of third-party support, and arrival of the vastly superior PC Engine, ensured Sega’s hardware ventures throughout the 1980s were ill- timed and ill-fated.Believing that Sega’s success might lie in porting its arcade hits to the home, CEO Hayou Nakayama took the decision to try the company’s hand at a new console launch, developing a domestic version of Sega’s successful coin-operated technology, the System 16. Codenamed MK-1601, Sega announced a launch slot of autumn 1988, hoping the system could establish dominance in the next generation of video game hardware as the first ‘16-bit’ system.On 29 October 1988, Sega launched the MK-1601, now renamed the Mega Drive, in Japan for ¥21,000 (£114) alongside four titles, Altered Beast, Super Thunderblade, Space Harrier II (an exclusive sequel to Yu Suzuki’s popular arcade title) and Osomatsu-kun. While the ease with which the system handled the arcade ports caused a small stir in Japan, Nintendo’s dominance prevented Sega from making the financial impact the company wanted. Space Harrier 2, a launch title for the console in Japan. This feature is an extract from Simon Parkin’s book, An Illustrated History of 151 Videogames. In a shift of focus, Nakayama decided that the system’s fortunes lay in the West and charged the US wing of the company with a Japanese mandate: ‘Haku Mandai,’ or ‘sell one million consoles.’ Copyright issues with the ‘Mega Drive’ name in the US forced a name change, an inconvenience that nevertheless enabled the American team to spell out their aspiration for the machine, nothing short of a rebirth of Sega: Genesis. The team assumed that gamers who had joined the Nintendo camp with the launch of the NES five years earlier would now be looking for more mature content. The marketing team designed a campaign to paint Nintendo as a family and children’s company, and Sega as a more grown-up offering.On 14 August 1989, Sega shipped a limited quantity of console to stores in New York and Los Angeles, priced at $199 (£125). Celebrity-endorsed sports titles Arnold Palmer Tournament Golf and Tommy Lasorda Baseball were twinned with arcade behemoths Golden Axe and Altered Beast to reinforce Sega’s positioning of the console as a more mature machine. The approach worked and within one week industry figures put Sega as owning 65 per cent of the market share, growing to 90 per cent by the Christmas period.However, the Nintendo user base remained greater in the West, and Sega began a campaign, using slogans such as ‘Sega does what Nintendon’t’. In Japan, Sega had all but given up hope of besting Nintendo and now focused all of its energy at beating its rival on foreign soil, now supported by a Mario- beating mascot, Sonic The Hedgehog. While the Mega Drive slid from popularity with the release of a number of ill-advised add-ons, its impact was still significant, moving public perception toward games to send the medium into its cultural adolescence. Nintendo’s Game Boy became synonymous with handheld gaming overnight. A system with interchangeable games, it could be played anywhere, combining portability, miniaturization and entertainment – three of the most important attributes of today’s emerging technology – into a single, affordable, power-light device.Not only that, but the Game Boy is arguably the most iconic piece of video game hardware design. Its light grey casing is punctuated by two maroon buttons and a jet black d-pad, while a single bright red power light winks to life on the left of a square, luminous green screen, a miniature window into a world of two-tone possibility.The system’s marriage to Alexey Pajitnov’s Tetris is a pairing of hardware and software that is yet to be bettered, establishing the handheld’s place as a near-universally recognizable cultural artefact. Not only that, but this was the system to establish Nintendo’s most successful line of gaming hardware, one that stretches across the years in numerous iterations, leading up to the Nintendo 3DS, a handheld system in whose three-dimensional face the bold likeness of the original Game Boy can still be recognized.And yet, even at launch, the Game Boy’s components were technically obsolete. Its creator, Gunpei Yokoi, the man almost single-handedly responsible for Nintendo’s entry to the video game market (page 16), had been responsible for Nintendo’s range of Game & Watch handhelds, LCD-based machines dedicated to a single game. The Game & Watch games were created to make use of cheap LCD screens, a re- purposing of elderly technology that Yokoi imaginatively described as: ‘Lateral Thinking of Withered Technology.’ Game Boy’s success led to a multitude of new iterations of the hardware. It was this same philosophy that directed Yokoi and his 45-man team of designers, programmers and engineers to create the Game Boy, a system assembled from inexpensive, near-obsolete components that kept manufacturing costs to a minimum. While Sega and Atari busied themselves working with high-powered handhelds with colour graphics and impressive sound capabilities (the Game Gear and Atari Lynx respectively), Yokoi and his team opted for a monochrome screen and a tinny speaker. As a result, the Game Boy outlasted its rivals by several times over.The biggest benefit to Yokoi’s decision to use outdated technology was lowered manufacturing costs. As a result of the team’s insistence on using cheap components inside the Game Boy shell, the launch price was set at just $89.99 in the US, $100 cheaper than Atari’s rival Lynx, and $60 cheaper than Sega’s Game Gear. Nintendo’s competitors were quick to jump upon the Game Boy’s weaker specifications. Sega aired a number of negative advertising campaigns in the US that mocked the Game Boy’s monochrome display in comparison to Game Gear’s full colour display. But despite the jibes, the Game Boy’s popularity rose. The system’s affordability also elevated Nintendo’s own expectations, with company president Hiroshi Yamauchi predicting sales of 25 million within the first three years of its release. In reality, three years after its launch, the Game Boy had sold 32 million units, far exceeding Yamauchi’s seemingly wild speculation.In contrast to the console side of its business, Nintendo subjected the Game Boy technology to a series of iterations, releasing the Game Boy Pocket, then the Game Boy Color, small upgrades on the original hardware, that allowed the hardware to develop without rendering its back catalogue of over 650 games. Later, the Game Boy Advance arrived, a more powerful piece of hardware and one that itself went through a number of upgrades through the SP models and finally to the beautiful Game Boy Micro. With the arrival of Nintendo’s DS, however, the Game Boy brand took a back seat – though many would love to see it return again. The folks at NYC Resistor have a thing for circular displays, it seems. Their earlier Hexascroller was a ceiling mounted display with six 30×7 displays – good enough to display the time and a few textual message in six directions. The Octoscroller bumped up the display capability with eight 16×32 RGB LED panels. Now the Megascroller, a 32-sided 512×64 display is hanging in the hackerspace, complete with 360° Mario and Pong. As far as applications go, they naturally have Pong, but a more interesting application is the side-scrolling Mario that requires you to move around the display as you play. You can check out a video of that below. If you’d like to see the Megascroller in person, as well as a whole bunch of other crazy blinking interactive projects, NYC Resistor is holding a an interactive show this weekend, beer provided.